Since 2009, I have been writing articles about art licensing including 16 different manufacturing industries that license art for their products. This article combines and updates the lists of manufacturers mentioned in those articles. Some manufacturer websites in those articles are no longer available. The reason could be that they are out of business, purchased by another company, changed their business name, or no longer maintain a website. Note: Not all manufacturers show their products to the public. To determine if your art is a good fit for those manufacturers, you should search the Internet for retail stores that sell their products. Read "Licensing Art to the Calendar Industry" for information about this industry and what kind of art that manufacturers want to license. Below is an updated list of manufacturers and links to their websites. Read "Licensing Art to the Greeting Card Industry" for information about this industry and what kind of art that manufacturers want to license. 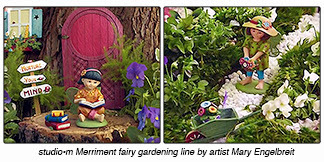 Read artist Kate Harper's article "Artist and Writer Submission Guidelines for Card Companies" to see a list of over 50 manufacturers that license greeting cards. Read "Art Licensing: POD E-Stores - The Best-Kept Secret of Birthday Card Designers" by Jerry McLaughlin (founder and CEO of Blow Birthday Cards) about print on demand greeting card E-stores. Read "Licensing Art to Coaster Manufacturers" for information about this industry and what kind of art that manufacturers want to license. Below is an updated list of manufacturers and links to their websites. • Studio M / Magnet Works Ltd.
Read "Art Licensing: What's With the Adult Coloring Book Craze?" and "Art Licensing: Update on Adult Coloring Craze" for information about this industry and what kind of art that manufacturers want to license. Below is an updated list of manufacturers and links to their websites. Read "Licensing Designs to the Quilt and Craft Fabric Industries" for information about this industry and what kind of art that manufacturers want to license. Below is an updated list of manufacturers and links to their websites. Read "Licensing Art for Cloth Products" for information about this industry and what kind of art that manufacturers want to license. Below is an updated list of manufacturers and links to their websites. Read "Licensing Art to the Flag Industry" and "Art Licensing: E-store Owner's Perspective About the Flag Industry" for information about this industry and what kind of art that manufacturers want to license. Below is an updated list of manufacturers and links to their websites. • Wincraft (sells to large chain stores) - Search the Internet to see examples of Wincraft flags sold by large chain stores. Read "Licensing Art for Coffee Mugs" for information about this industry and what kind of art that manufacturers want to license. Below is an updated list of manufacturers and links to their websites. Read "Licensing Art to the Paper Partyware Industry" for information about this industry and what kind of art that manufacturers want to license. Below is an updated list of manufacturers and links to their websites. Read "Licensing Art for Decorative Ceramic Plates and Tabletop Products" for information about this industry and what kind of art that manufacturers want to license. Below is an updated list of manufacturers and links to their websites. Read "Licensing Designs to the Melamine / Acrylic Tabletop Industry" for information about this industry and what kind of art that manufacturers want to license. Below is an updated list of manufacturers and links to their websites. Read "Licensing Art to Print Manufacturers" for information about this industry and what kind of art that manufacturers want to license. Below is an updated list of manufacturers and links to their websites. • Greg Young Publishing Inc.
Read "Licensing Art to the Jigsaw Puzzle Industry" for information about this industry and kind of art that manufacturers want to license. Below is an updated list of manufacturers and links to their websites. Read "Licensing Art to Rug and Mat Manufacturers" for information about this industry and what kind of art that manufacturers want to license. Below is an updated list of manufacturers and links to their websites. Read "Licensing Designs to the Scrapbooking Industry" for information about this industry and what kind of art that manufacturers want to license. Below is an updated list of manufacturers and links to their websites. Read "Licensing Art to the Decorative Tile Industry" for information about this industry and what kind of art that manufacturers want to license. Below is an updated list of manufacturers and links to their websites. The above lists show only some of the manufacturers that license art. More can be found by searching the Internet, looking at products in stores (especially gift stores), attending trade shows like the Atlanta Gift Market, and joining the Art Licensing Show.com (ALSC). • Art Licensing: When do you Submit Art to Manufacturers? 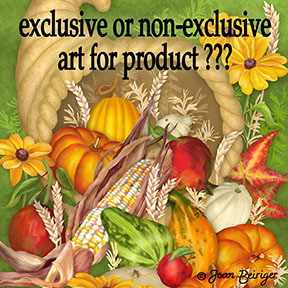 • Art Licensing Editorial - Should Artists Sign Exclusive Agreements? 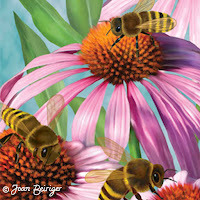 • One Painting Can be Licensed for Multiple Products - Right? • Art Licensing: Should you sell art on POD stores? Art Licensing Editorial - Should Artists Sign Exclusive Agreements? In the art licensing industry it is often heard that artists should NEVER sign an exclusive agreement because it will restrict them in being able to get licensing deals and earn revenue. However, that may not always be true. Just like so many other things in this industry it depends upon the artist and what she/he hope to achieve in licensing her/his art. The following discusses exclusive and non-exclusive agreements that apply to 1. art licensing agencies that represent artists, and 2. manufacturers that license art for their products. The majority of art licensing agencies in the United States require that their artists agree to an exclusive representation. That means the artists use only one agency to get them licensing deals in ALL product industries worldwide. Although, if the agency does not license art to foreign manufacturers, the artist may hire another agent to only represent her/him in foreign countries. Note: The reason agents want to do exclusive representation is to avoid the confusion if several agents submit an artist art to manufacturers. Not only do the manufacturers think it is a waste of their time to view the same art shown by several agents but if they are interested in licensing any of the art they would not know which agent to contact. Some agencies do non-exclusive representation because they concentrate only on particular products such as fabric or wall art. Thus, some artists do have several agents. However, it can get sticky if one of the agents decides to license the art for products that they were not hired to. Some industries are very competitive and want to use artist brands to sell their products. For instance, many fabric companies that sell their products to the quilt industry require their artists to be exclusive to them since they are showcasing and promoting the artists. That means those artists are not allowed to license their designs to other fabric companies. As artist Tara Reed points out in "5 Things to Consider Before Signing an Exclusive Art Licensing Agreement", an artist may decide to enter an exclusive agreement if they will ". . . guarantee a certain amount of sales per year (hard to come by at the moment), guarantee that they will bring out a certain number of products, promote you and your brand in specific ways… you want something in return for cutting off other opportunities for a few years." Also read art licensing agent Maria Brophy's article "Should you Sign an Exclusive Agreement - What to Consider". It has excellent examples on when Maria DOES NOT and when she DOES sign exclusive agreements. The most common exclusive agreement in the art licensing industry is when manufacturers license an image for their products. In fact, most product licensing contracts have this stipulation in it. The agreement requires that the artist NOT license the SAME image to other manufacturers in the SAME industry until after the contract expiration. The purpose of this exclusivity is so that the manufacturer is not competing with other manufacturers that are selling to the same consumer base. An exception is in the wall décor industry where non-exclusive agreements are offered. That is why the same image for posters and prints may be in many print-on-demand wall décor Internet stores. However, the same image may be licensed to different manufacturers at the same time and for the same product if their customer bases are different. For example if the image was licensed to a manufacturer that sells only to general retailers it may be okay to license the same image to a manufacturer that sells to the mass channel (chain stores) and to non-profit companies. Of course, you should inform the companies that are involved to make sure they have no objections in licensing the art to another manufacturer. If you do not inform them, you may be infringing on contracts since you may not be aware that besides selling to general retailers the manufacturer also sells to chain stores. Note: A difficult situation could occur if an artist license VERY similar looking images to different manufacturers that produce the same products. Manufacturers want to sell art that is different from their competition. They would be unhappy if the images are so similar that customers would mistake them for the same art. It is always wise to inform the companies involved to make sure there is no conflict. Read all contracts and agreements closely and make sure you understand all the terms and clauses in it including "exclusive". If you are unsure, I recommend that you hire an attorney experienced in art licensing legislation to look it over before you sign it. It is less expensive to pay an attorney to make sure the contract is fair to you than to find out later that you signed a contract with clauses unfair to you. E-Stores (online/electronic stores) are becoming more and more popular on the Internet. Consumers have found that it an efficient way to search for products with the best prices, find products that local retailers no longer stock, and search for unique and personalized products for gifts. Depending on the type of product(s) sold, owners of e-stores can take advantage of printing on demand (POD) to keep a low inventory, and sell personalized products. Personalized products appeal to a smaller number of consumers (niche) and usually are not available in retail stores. Below is an article by Jerry about why he thinks an POD e-store with unique greeting cards is fulfilling consumer wishes that is lacking in retail stores. Birthdays are a gift – a once a year chance to tell our friends and loved ones that they are special to us without either of us having to feel weird about bringing it up. But even on a day dedicated to celebrating a special person in our lives, saying what we want to say can be hard. So, for the same reason that the President has speechwriters, we rely on birthday card designers to awaken shared memories, make us laugh or blush, and give voice to our deepest feelings. But is that what birthday card designers are doing for us today? Not so much. Yes it’s true that Americans bought 1.7 million birthday cards today, just like they do every day. But most of those shoppers say they would have liked to find a more special card. What makes a birthday card special? A special birthday card recalls for both the giver and the recipient a specific shared memory, revels in a shared sense of humor, or reveals a sincere feeling. To evoke a shared memory we need a specific trigger. For example, let’s say you and your wife shared your first kiss on a camping trip with friends; you know she’ll appreciate a card that captures a couple kissing outside of a tent or a whimsical camping scene. Why aren’t we making specialized cards that customers crave? The historical root of the problem is in the high cost of running a retail store. Every successful retailer knows space in the store is precious. So before they dedicate some of that precious space to a birthday card design, they’ve got to expect to sell a lot of that same design. Therefore they have to offer designs that will appeal to almost everyone that comes in looking for a birthday card. The result is a lot of cards on the shelf that are suitable for anyone, meaning they are special for no one. In my view, too often independent designers are trying to out-Hallmark Hallmark. They are designing cards that will have the broadest possible appeal. But rather than fight the big card companies head on, designers can make cards that reference very specific interests, objects, activities, experiences, or sentiments. These specialized cards don’t appeal to everyone, but they appeal very strongly to enough buyers to make the designer very successful, and appreciated. The watchwords of the successful independent birthday card designer are “specialized” and “insightful”. At Blow Birthday Cards, we also focus more on finding great designers than on finding great cards. We look for designers whose birthday cards have visual or verbal elements that relate to some narrow interest or specific aspect of life. For example, we prefer a yoga card to an exercise card. The more specialized the card, the more perfectly it will fit someone. While visual artists have created some great birthday cards, people that think of themselves more as storytellers have designed many of the best birthday cards. The great birthday card is an effective communication, like a great advertisement. So-- what’s the best-kept secret? In a country with 330 million birthdays this year, a card that is so specialized that it is perfect for someone you know will be perfect for 100,000 other people too. Those are the birthday cards customers cannot find in stores. Those are the birthday cards that sell online. Those are the birthday cards customers really want. 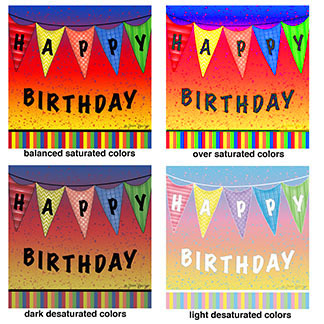 Note: Blow Birthday Cards is a member of Art Licensing Show (ALSC) and artist members can connect with Jerry McLaughlin. Artist "profile members" can also show him their art on the ALSC website. Art Licensing Editorial: Do artists need to create collections? In the art licensing industry, the most heard answer to questions asked is "it depends". And that is also the answer to the question on whether artists need to create art collections. A collection has many meanings and the following discusses the reason why some types of collections should be created while others may not be needed. • What is a collection? A collection can be images that are organized in various ways, or complimentary images created for a specific product, or complementary images and associated designs created for use on multiple products. 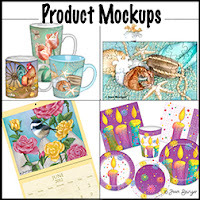 All these type of collections are useful when submitting to manufacturer art directors (ADs) for licensing consideration and for placing on websites so that ADs can easily find the art they are interested it. #A - images organized by themes etc. The advantage in organizing art into collections of themes, seasons, holidays, or occasions is that it is easier for ADs to find art they are interested in licensing and thus the more often they will visit the artist/agent website. Also ADs request art for particular seasons, holidays, and themes. So if the art is already organized into those collections it is easier for the artist to find and submit the art. The following are possible ways to organize art into collections. Some artists organize their art on their website into collections by the type of product that it was created for. For example, the product collections could be greeting cards, gift bags and wrap, decorative flags, fabrics, and tableware. A collection can be one main image that is formatted various ways such as vertical, horizontal, square, and round. Formatting an image different ways takes time but it could increase the likelihood in being licensed. For instance, the greeting card industry produces cards that are vertical, horizontal and sometimes square and round although vertical images significantly out number horizontal images. And, many decorative flag companies sell doormats and mailbox wraps besides vertical flags so they need both vertical and horizontal images. By submitting various formatted art to card companies may mean getting a deal or not. For instance, if the image was submitted only as a vertical format and the AD decided that the image would look better as horizontal then it may not be licensed. And, by submitting images in both formats to flag companies, additional products (mat, mailbox wrap) have a better chance in being licensed instead of only a flag. Artists typically create art that is vertical since it is the most used format for products. It is true that companies sometimes ask for changes when they are considering licensing an image. But not all companies have the time to wait for images to be reformatted and instead they license art that has already been formatted numerous ways. Also, if the art is already formatted it is ready to go when artists wish to submit art for coasters, plates, etc. (square and round), OR placemats, serving trays, cutting mats, rugs, etc. (horizontal). Thus, having art formatted several ways can be a time saver in the long run and also increase the possibility in licensing the art. This type of collection is two or more images that compliment each other. It is created for one or more specific type of products such as boxed greeting cards, calendars, fabric for the quilting industry, dinnerware, coaster sets, paper party ware, wall décor, gift bags, etc. Creating this type of collection is time consuming and since it is created for a specific type of product(s) it may not be usable to be licensed for other products. When art collections are discussed in the art licensing industry, this is the type of collection that is often implied. It is a series of images including patterns, icons and borders that compliment the images for use on multiple products. 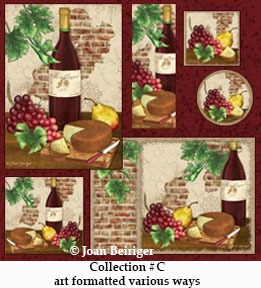 Some successful licensed artists recommend that the collection consist of 1. at least four central images; 2. one rectangular, circular, oval, and square frame; 3. at least three borders with different widths; 4. at least several repeating patterns; 5. several backgrounds; 6. at least six or more supplemental icons, 7. text if it is appropriate. The intention on creating this type of collection is that most of the art is already finished before submitting to ADs so the art is ready for multiple products with minor editing needed. And, the art has a better chance in being licensed because the AD can choose from a selection of looks instead of only one. The drawback in creating this type of art collection is that it is VERY time consuming resulting in artists not being able to create as many different images and have less art to submit for licensing consideration. Also, not all of the recommended components in the collection as listed above can be used on all products. It is a waste of time in creating them if they will not be used. Thus, I recommend that if you want to do this type of collection you create a modified version of it depending on the kind of products the collection are intended for. As discussed in #A and #B, it is very useful to organize art into collections. Thus, I recommend that art be organized into at least #A collection. To increase the opportunity in licensing art for more products, it is probably a good idea to create collections as discussed in #C unless there is no need to format art in various ways. For instance, surface designs are created as repeating patterns for fabrics, scrapbooking and other paper products. There are few opportunities to license repeating pattern designs for products that require formats other than square and maybe vertical so it is not necessary to format the designs as round or horizontal. Many artists think that all the art they create will be suitable to be licensed for ANY kind of product. Unfortunately that may not be true. Art that is licensable depends on whether it incorporates the current trends, themes and art styles wanted by consumers. Not every product or even each manufacturer in the same product industry uses the same specifications so the art may be only licensable for one, a few, or many types of products. 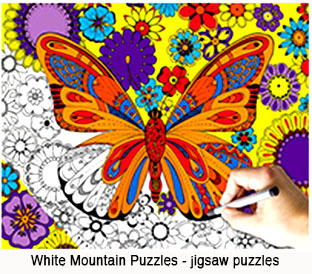 For instance, intricate and collage styled art that was created for jigsaw puzzles (i.e. a bunch of children playing in the snow) would not be licensable for many other products such as decorative flags, tableware, shower curtains and bathroom accessories. Therefore, there is no reason to create a collection of art as described in #E if the art is not licensable for a wide range of products. However, collections are necessary if the artist wishes to license their art to manufactures that sell products as collections that are listed in collection #D.
As mentioned in this article, it depends on whether artists should create collections of their art. Some should be created such as #A while others like #E may not be needed; at leased for all art. Creating collections, especially for #E, is very time consuming and if the art is not suitable for a wide variety of products it is a waste of time creating them. Some artists intentionally begin their licensing career by creating art for only one product industry such as greeting cards, or fabrics. Others may discover by accident that their art tends to be more licensable for one industry than others. So there is no need to create collections #D or #E. However, once they are successful in licensing their art for the one product and decide to branch out into other industries, it may be time to create collections for art that is suitable for a variety of products. Marketing is imperative in selling products to consumers. And, Dover Publications absolutely thought outside-the-box in promoting coloring books in the United States by getting permission last year from the U.S. Registrar to observe August 2 each year as National Coloring Book Day (NCBD). Companies, organizations and individuals besides Dover are endorsing National Coloring Book Day on August 2 by having parties, book signings, coloring contests, and other activities throughout the United States. By searching the Internet, you can read a large number of articles mentioning upcoming events celebrating National Coloring Book Day this August 2. Adult coloring parties sponsored by various organizations, companies, and individuals will take place in libraries, community centers, bookstores, cafes, private homes, and other locations. Persons are invited to attend most of the events at no cost. For instance, on August 2, Thunder Bay Press is sponsoring and providing coloring books and colored pencils for the coloring day event at 12 bookstores across the country. To find other locations for NCBD parties throughout the U.S., view Dover's National Coloring Book Day website. Dover Publications is sponsoring meet-and-greet artists across the country where several artists will sign copies of their coloring books. Note: Other coloring book publishers are also probably having artist-signing events but I did not have the time to search the Internet. Coloring contests and giveaways are also found on the Internet. For instance, publisher Leisure Arts is having a "National Coloring Book Giveaway" contest. Note: There are many other coloring contests and giveaways on the Internet. Continuous marketing by hundreds of companies, organizations and individuals like the NCBD events help to keep the adult coloring book industry alive. And, offering free parties brings in more consumers wishing to purchase books as they discover the therapeutic value coloring has including the fun and sharing of their colored creations with others. • "Art Licensing: What's With the Adult Coloring Book Craze?" 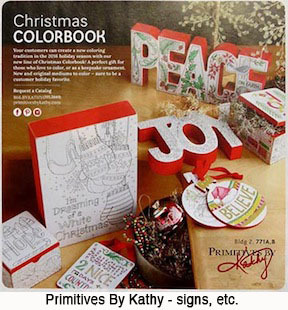 • "Art Licensing: Update on Adult Coloring Craze"
Last year adult coloring books went viral because press releases in magazines, television, and the Internet promoted that it is very therapeutic to reduce stress by coloring pictures. Also, Dover Publications, who has been publishing adult coloring books since 1970, sponsored a National Coloring Book Day, that is officially observed now on August 2 each year. All the hype resulted in thousands of adult coloring books being published by numerous companies and the formation of coloring book clubs and parties. Read "What's With the Adult Coloring Book Craze?' for more information about the adult coloring book hype. Coloring books are so popular that some companies include a coloring book with their products as an incentive to purchase the products. Many Internet sites offer coloring pages that can be downloaded at no cost. And, a pdf file of a 92 page coloring book “Enjoy the Simple things: A Holiday Coloring Book for kids 1 to 92” with art created by 70 artist members of the art licensing community, Art Licensing Show.com, can be downloaded at no cost. Maybe Adult Coloring will not only be a fad but also become a trend as more products become available! Below is a resource list of manufacturers that license drawings suitable for coloring. Read "What's With the Adult Coloring Book Craze?' for an additional list of companies that license drawings for adult coloring books. Note: View the on-line catalog. Art Licensing Editorial: Should You Use Color Trends in Art? Note: The number in the bracket [ ] indicates the article the quote is from. See the article title in the Reference section at the bottom of this article. “When Pantone releases their color of the year they are setting the tone for upcoming trends. They pull influences from fashion, automotive design, interior design, technology and trade shows. They analyze how color impacts mood and how it relates to current events.”  And, “The annual announcement ultimately influences product development, purchasing decisions, product packaging and graphic design.”  Many manufacturers but not all use Pantone color trends for their products although it may be several years before they appear on the products because of the time needed to produce them. There were a lot of comments when Pantone announced 2016 Colors of the Year last December. But, surprisingly they were more constructive than negative. Mentioned in the many articles I read, pale pink and baby blue are already seen on clothing in fashion runways, on kitchen appliances, tabletop, household linens, cosmetics, iPhones, shoes, home décor, and in advertising. Should artists use color trends in the art they create for licensing consideration and more specifically Pantone 2016 Colors of the Year? The answer is the same that is often heard in the art licensing industry; it depends! Some manufacturers are willing to take a chance on using new color trends in the hope to sell more products while other manufacturers use only colors that have been proven to sell their products. Previous Pantone Color of the Year was more applicable on a large variety of products especially in the gift industry because the color hues were bold. 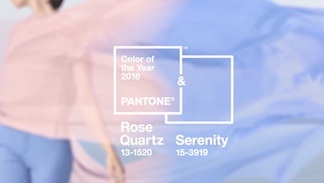 The pastel colors of the Pantone 2016 Colors of year does not necessarily work for as many products. Some art themes are very color specific such as most holiday themes. Easter uses mostly pastel colors so using Pantone’s Rose Quartz and Serenity (R&S) will fit well for Easter products. Those colors may also work well for Christmas decorations even though the traditional colors are red and green. Some manufactures that produce Christmas decorations seem to be willing to try new colors even though they tend to be a fad and sell well for only a couple of years. So, I will not be surprised to soon see R&S decorated Christmas trees at the Atlanta Gift shows. R&S colors on other holiday themes would not work. But, R&S colors for non-holiday themes such as for birthday and inspirational may work. And just like themes, some colors work for certain products and not for others. For instance, the decorative flag industry uses bright colors so that images standout and can be seen 40 feet away. The R&S pastel hues will not work for flags but may work if they are more saturated in color or are paired with other colors. Check out Pantone’s website for suggested colors to pair with Rose Quartz and Serenity colors. Should artists use color trends? Sure they should use color trends but only IF the art they are creating for products will sell the products for manufacturers! And, the only way to know what colors work for the manufacturers is by studying their websites and websites of retailers that sell their products. For information about the different product industries and some links to manufacturers that licensing art, click HERE. Researching manufactures and the product industries that sell their products is a lot of work! But, it is worth the effort to have a better chance in licensing your art. Artists that are new to the art licensing industry are often frustrated that they have not been able to license their art to manufacturers (licensees). They may have been successful in selling their art at street fairs, in art galleries, or e-stores like Etsy. But, the art licensing industry is very different than these types of venues since licensees do not just sell to individuals but to the mass market through retail via multiple channels of distribution. Thus, art must appeal to a wide range of consumers. In the art licensing industry, the reason why licensees license art to be placed on their products is to entice consumers to purchase them. So licensees look for well executed art with themes that are popular with consumers. Each licensee has specific art needs that often change with the fluctuation in economy, technology and trends. Even in the different product industries such as greeting cards, or decorative flags or fabrics each licensee tends to license art with a certain art style(s). It is a MUST that artists make sure their art style(s) and themes fit the licensee product line(s) BEFORE submitting art to them so that they do not waste their own time and the time of licensees. A good resource on manufacturers in various industries that license art can be found in the article "List of Manufacturers that License Art". Note: The title of this article is somewhat misleading because it insinuates that the information given in the article provides a full-proof way to get licensing deals. Unfortunately, there is no formula that will achieve that result. But this article does discuss what is required so that images submitted to licensees have a better chance in being licensed. Why isn't all art licensable? The art licensing industry has hundreds of artists that are successful in licensing their art because 1) the art technique is well executed, and 2) the art style(s), and 3) themes are wanted by licensees for their products. If any of these key components are missing, the art is not licensable or is difficult to license. The following discusses the art techniques that makes art well executed, art styles used for products, and art themes that are popular with consumers and licensed by licensees. Read the related article, "Editorial: Not all art is licensable"
Agents do not want to represent an artist and licensees will not license the art if the artist's work is not good enough. In other words, the art technique is not well- executed and the main reason why artists have difficulty in licensing their work. Well-executed art has pleasing colors and the objects, and colors in the art is well balanced so that the viewer's eyes moves all over it. Below is information on art techniques (composition, color saturation, color combinations) that are important in well-executed art. Using a variation of color saturation in the art gives contrast to images so that they standout. If TOO MUCH color saturation is used in the image, there is a loss in shading and contrast in the images. While TOO MUCH unsaturated color makes the art dull or muddy looking. Thus, a good balance between saturated and unsaturated colors should be used in achieving well-executed art for products. However, some industries such as wall décor tend to license art that has moderately dark de-saturated colors. And, licensees that sell baby clothing and accessories mainly use art with light de-saturated colors (pastels). Although, more saturated art and designs for baby products is now trending. In Photoshop, using the Hue/Saturation or Curves functions can easily alter the color saturation of images. Using pleasing and popular color combinations in art is important for the art to be licensed. As is stated in "Basic color schemes - Introduction to Color Theory" . . . "With colors you can set a mood, attract attention, or make a statement. By selecting the right color scheme, you can create an ambiance of elegance, warmth or tranquility, or you can convey an image of playful youthfulness. Color can be your most powerful design element if you learn to use it effectively." Read the above article to learn more about color theory and get links to websites with apps to create color combinations. Also check-out the article, "100 Brilliant Color Combinations and How to Apply Them to Your Designs." Certain color combinations are popular and expected to be used on art for holidays and certain themes. For instance, Valentine's Day art should have red and white; baby and Easter - pastel colors; Halloween - black and orange; Christmas - traditional dark red and green; Saint Patrick's Day - greens; nautical - blues; patriotic - red white and blue. Although, often these traditional color combinations may vary depending on type of products, trends, art styles and demographics. Currently colors for Halloween are bright fluorescent looking shades of orange, blue, green, pink, and yellow with black besides the traditional orange and black. Un-saturated colors of red, white and blue with a distressed art style are being used for some nautical art. 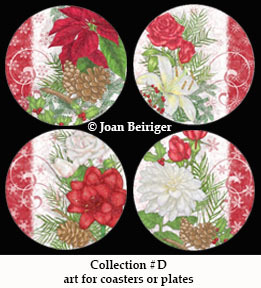 And, bright red and chartreuse green with a whimsical art style is used for youthful and fun Christmas images. For the last several years, a black background was used for many art themes but now not as much. Duo toned (red/black, white/black, grey/black, turquoise/white, etc.) graphic and flower patterns are now trending for home decor, clothing and accessories, kitchen, paper products and more. The correct placement of motifs AND color in a design or painting is an important aspect in achieving a good composition. Design principles like the Rule of Thirds creates balance in the composition. The Rule of Odds makes a composition more dynamic and interesting. And, the Rule of Simplification eliminates the clutter in the composition so the viewer can concentrate on primary objects. There are many more design principles so read, "Creating Licensable Art: Composition Tips" for more information about them and links to other articles that have more in depth explanations and examples. Not all art styles (traditional/realistic, whimsical, abstract, cartoon, stylized, graphic, distressed, etc.) are licensable for ALL product industries, or even by licensees in the same industry. That is because of the kind of products licensees sell, the demographics of their customers, and their distribution channel. For instance, abstract art may be licensable for fabric and wall décor but not for many other industries. And, humor and cartoon art styles and themes may be licensed by some licensees in the greeting card industry but not by other licensees in the card industry. Art styles used on products change over time depending on trends and other factors. So styles that were predominate five years ago for certain product industries are gradually being replaced by other art styles. For example, in the greeting card industry whimsical and stylized styles are now more prevalent than the traditional realistic art styles. And, instead of using mainly traditional and SOME whimsical styles, the decorative flag industry now uses whimsical, stylized, distressed and SOME realistic art styles. Some artists create art with a theme they like and then try to find a manufacturer that will license it. But successful licensed artists create art to be put on products with themes for the mass market or niche market that they know is popular with the consumers for those markets. Knowledge is power. Knowing what kind of images that a licensee want is crucial in being able to get deals. 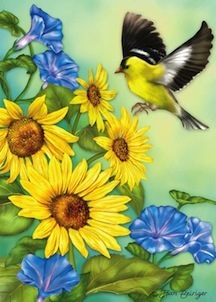 For example, most licensees in the greeting card industry want art that gives a meaningful and sentimental feeling. And, the decorative flag licensees want art that is colorful with central images that can be distinguished 20 feet away. Although licensees say that you want new art, many are not willing to take a chance on introducing themes that may not sell. So they tend to license art with themes that are popular with consumers and proven sellers of their products. Hint: Art with popular themes and have a fresh new look are often licensed. Below is a list of some popular art themes. – Nature - flowers (sunflowers, daisies, geraniums, etc.) birdhouses, butterflies, garden birds, dragonflies, frogs, roosters, etc. – Coastal and Beach scenes - seashells, lighthouses, sea birds, flip-flops, umbrellas, beach chairs, etc. 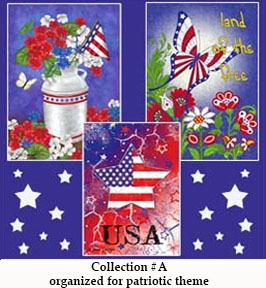 – Patriotic - American flags, patriotic colored flowers, stars, fireworks, etc. – Easter - eggs, bunnies, flowers, religious crosses and scenes, etc. – Christmas - Santa, snowmen, cardinals, poinsettias, pinecones, snowflakes, reindeer, religious scenes, etc. – Halloween - pumpkins, scarecrows, spider webs, crows, non-scary witches and monsters, etc. 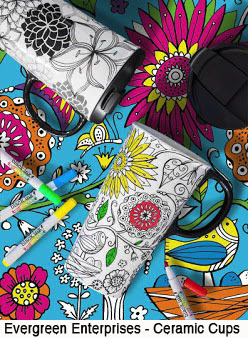 The concept "less is more" of simple duo colored patterns has replaced art themes on many products such as gift bags, gift wrap, totes, plastic tumblers, etc. Read "Art Licensing Editorial - 2016 January Atlanta Market Trends" for more information and pictures about this art trend and other trends seen at the 2016 January Atlanta gift show. Just because your family and friends love your art and you get accolades from other artists does not necessarily mean that the art you create is licensable. Of course, if you are getting contracts you know your art is good enough to get licensed. But if you are not, then maybe your art technique needs improving or you are not creating the right themes. So, how do you find out? It is better to get input from persons that are known experts in the art licensing industry such as art licensing coaches/consultants than from family and friends. But even coaches will not be helpful if they do not give constructive criticism and are not able to give suggestions on how to improve the art. Coaches may be experts in the art licensing industry but art direction or giving constructive criticism is not always their forte. So if at all possible, get recommendations or ask the coach before you hire her/him. Some art licensing coaches are listed in the article "On Art Licensing Coaches (consultants)". Another way to determine if your art is good enough is to be IMPARTIAL and compare your art with art that has already been licensed. Study the art that has a similar art style as yours. Ask yourself questions like: What makes the licensed art outstanding; colors, placement of icons? Is my art as good as the licensed art or does it need to be improved? Hint: This method in recognizing that your art is not good enough will NOT work unless you are brutally honest when comparing your art with the licensed art. Note: An excellent e-store to compare decorative flag art with licensed flag art is Flagsrus. And, the Leanin' Tree website is a great site for comparing your art to licensed greeting card art. Read my (Joan Beiriger) journey on improving my art to make it licensable in "Editorial: Is Your Art Good Enough to License?" The article also discusses more ways to find out if your art is good enough to be licensable. Creating art for products for the art licensing industry is NOT a hobby. It cannot be a hobby if you want to be successful in getting licensing deals and continue to get deals. It is not a couple of hours a week job but for some artists a 12 hour or more a day job. Artists are willing to spend countless hours because they are passionate in creating art for products, seeing their art on them, and hopefully earn enough money to make the hard work worthwhile. Successful licensed artists are prolific in creating art. They are constantly looking for inspiration for art to create and are continually improving the quality of their art. They are very observant wherever they are and look at designs and colors on products in retail stores, on e-stores, social media, and the clothing people are wearing to see what is trending. Researching for manufacturers that license art to see what type of art styles and themes they are licensing is a MUST if an artist does not have an art licensing agent to represent them. Note: It is well known that the more prolific artists are in creating licensable art, the more licensing deals they will get. 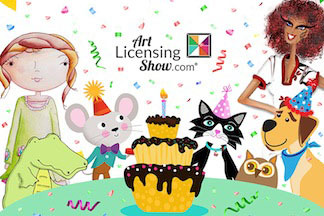 It has been a year since Art Licensing Show.com® (ALSC) first launched their website. And, it is proving to be a popular and successful method for art directors to view images for licensing consideration and for artists to easily connect with art directors. In case you do not know about ALSC, it is a online website that with one password art directors that license art (licensees) can view thousands of images created by hundreds of artists (licensors). Once the art director becomes a member (at no cost) she/he can see examples of artists’ work, choose potential artist work, and request permission to connect with the artist to view it, or specific themes, or all of their work. At a reasonable price, the ALSC membership subscription plan allows artists and art licensing agents to upload art into their own secured portfolio on the ALSC website. Artists have complete control in allowing or not allowing licensee members to view some or the entire portfolio. Note: Artists also has the option to become a member at no cost. They are able to connect with other members and have access to discussion groups and resource pages. But, their art will not be marketed by ALSC and they will not have a portfolio. Thus, they cannot show their work on the ALSC site to licensee members. As an additional benefit, ALSC is a full-fledged social media site that is focused on art licensing and where members can ask questions and share information in a variety of discussion groups. Read artist Cherish Flieder's article “Celebrating Art & Licensing” about how the Art Licensing Show began and how to become a member. Also, read “Art Licensing Show.com® - What is all the excitement about?" ALSC is not only successful in continual increasing membership but it has become a wonderful and flourishing community of members that share information and help others become successful in licensing their art. Members have stepped up and volunteered to moderate the different social media groups, give suggestions on improving ALSC, and brainstorming on marketing the ALSC site and ALSC portfolio licensors work. There are now 700 members consisting of licensees, artists, licensing agents, licensing coaches/consultants, and art licensing attorneys. Licensee members represent a huge variety of product industries such as fabric, decorative flags, greeting cards, gift bags, gift wraps, calendars, paper party ware, jigsaw puzzles, toys, wall décor, pillows, checks, coloring books, giftware, and much more. They sell their products to individual retailers, small and huge chain stores, e-stores, non-profit organizations, and as print-on-demand to consumers and retailers. ALSC has 27 specialized groups that members can join to discuss and share just about anything related to licensing art. Some of the groups concentrate on product designs such as tabletop, greeting cards, home décor, gifts, and textiles. Other groups discuss trends, marketing, tips/techniques for creating art, and post the latest news in the art licensing industry. There is even an art submission group where licensees request art themes they want to license. And, there is a monthly art challenge group, a monthly text chat group, and much more. ALSC constantly markets licensor profile member’s art on many social media sites such as Facebook, Twitter, LinkedIn, Instagram, Pinterest, Google+, ALSC blog, and posts videos on YouTube. Last year, a group of ALSC members brainstormed on taking advantage of the popular adult coloring book craze to promote ALSC and portfolio licensor members art. They recommended that ALSC publish a coloring book as a free pdf file to be downloaded and printed by anyone. The images could then be shared by family and friends and given to persons in hospitals, shelters, care facilities, and schools to bring happiness and healing by the simple act of coloring beautiful images. “92 Free Holiday Coloring Pages to Print & Share!” AND a printed bound book can be purchased on amazon.com. Note: The coloring book project was very successful! So stay tuned for future ALSC promotional projects. Below are statements from a few members on why they joined ALSC. - It is the ONLY Art Licensing Show online. - Be listed in the ultimate art licensing directory. - No cost or low cost depending on if you are an Artist or Art Director/Manufacturer. - Connect with industry leaders – It is a social network dedicated to Art Licensing. 3. Artist Karen Embry stated in her blog article, “Art Licensing Show Celebrates One Year Anniversary” that “With so many options/pricing plans for membership, there is something to fit in every artist’s budget. Art directors can join at no cost." 4. 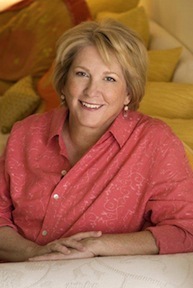 "I (Joan Beiriger) thoroughly agree with both Annie and Karen. An added bonus in being a member of ALSC is that I am able to connect directly with art directors and ask questions. I cannot do that with art directors that are not on the site unless I have already built a relationship with her/him. Also, because ALSC is constantly promoting licensor portfolio members work, my art is being marketed all over the internet at no additional price. You can't beat that!" One of the most asked questions by artists who are considering joining ALSC, is if artists are getting licensing deals from licensors members and how many. The answer is YES artists are getting deals but there is no way to tell how many because ALSC is not an art licensing agency and artists are not required to report if they have signed a contract. Also most artists do not broadcast their success and those that do wait until the product is introduced into the market. That normally takes a year or more. But, several ALSC artists have shared their success. Read what they have to say. 2. "I (Joan Beiriger) also had the same experience as Annie on ALSC although I have not yet signed a contract. Many art directors are interested in my art and three of them from different industries are shopping many images and collections to large chain stores. I never would have been able to contact these licensees or even realized that several of them license art if I was not an ALSC licensor portfolio member." Hint: Artists who are the most successful in connecting and getting licensing contracts with manufacturers not on ALSC use the same techniques when approaching ALSC licensee members. They do their homework and make sure that their art style and themes fit the licensee product lines before approaching art directors. Thus, successful ALSC licensor members do their homework, are proactive in asking ALSC licensor members to connect with them, and follow-up with a short message describing why her/his art will sell their products. There are so many artists on ALSC that sitting back and waiting for an art director to contact you does NOT work. To find out more about how to become a ALSC member click here. If you are an ALSC member and would like to share why you became a member and/or have a ALSC success story that you are willing to share, please write about it in the comment section of this article. Everyone would love to read it!